On June 2, 2011 the Center for Biological Diversity issued a press release announcing the release of a Draft Forest Service document highlighting the damaging effects of the Rosemont Copper Mine in Arizona. The preliminary US Forest Service document analyzing the likely effects of the proposed Rosemont open-pit copper mine in southern Arizona covers a wide range of potential negative impacts, including damage to air and water quality, thousands of acres of wildlife habitat and movement corridors, threatened and endangered species, groundwater, springs and streams, and public health and safety. The Forest Service continues to say that it has little choice but to approve the mine. Thousands of residents of Arizona participated in the public comment period authorized under NEPA (which ended in August 2008) to voice their opposition to this project. Since first proposing the mine, the Rosemont Copper Company has been engaged in a campaign of greenwashing, purchasing advertisements on the local NPR affiliate claiming that the extracted copper will be used for “solar panels” and “hybrid cars.” Yet the mine, if constructed, would use at least 8,000 acre feet of water per year (the average household uses about .25 acre feet) and cause permanent environmental and watershed damage from mine tailings and toxic runoff. 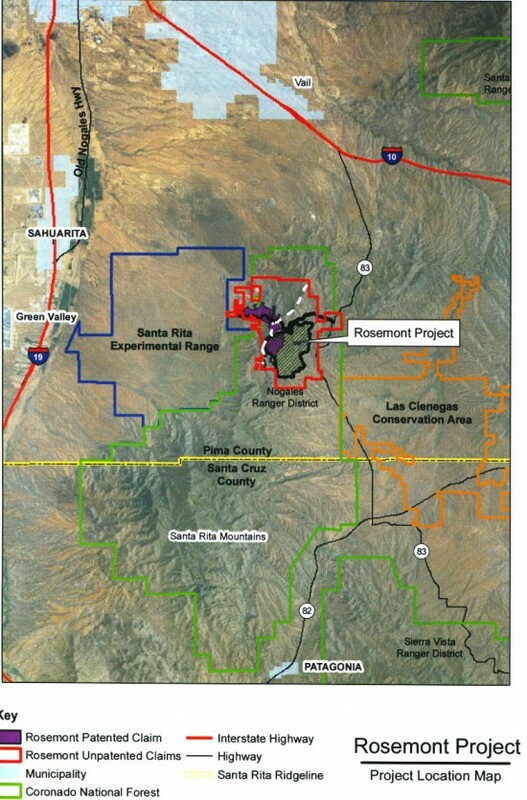 The Rosemont Copper Company, based in Canada, claims that the mine will bring economic opportunities to southern Arizona; yet any economic gains will be offset by the impact of mining activities on the tourism attracted by this pristine Sky Island ecosystem and the draining of aquifers in Sahuarita and Green Valley. More than 50 protesters remained in front of the Forest Service for several hours, demonstrating their opposition to the proposed mine and demanding that officials deny the permits. 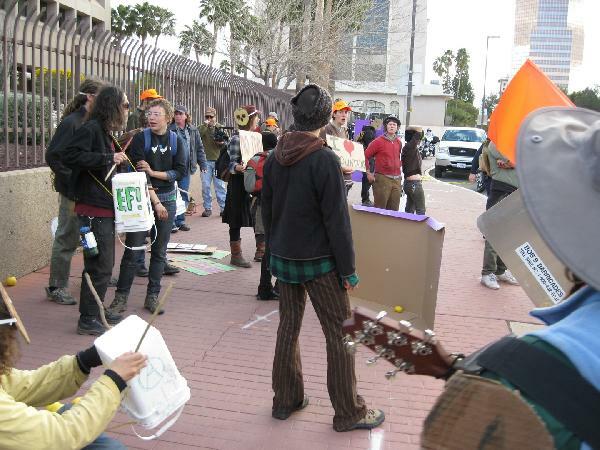 Prior to the demonstration, representatives of Chuk’shon Earth First! met with Forest Service officials, while protesters briefly blocked traffic on westbound Congress Street. In other news about the mine: March 2009, the Arizona Daily Star reported that Kathy Arnold’s car tire was slashed and her window etched because of her job with Augusta Resources Rosemont Copper Project, the company involved in the Draft EIS which wants to open a 1.2-square-mile open-pit copper mine in the Santa Rita Mountains.